Eligible candidates can apply offline for the Electrician & More Vacancies Job on or before 28/5/2016. Find more information about the vacancy like Age limit, Selection Process, Qualification, Application fee, How to apply etc can be found below. ESSENTIAL QUALIFICATION I. Semi skilled Tradesman a) Matriculation or its equivalent. b) National Trade Certificate (NTC)/National Apprentice Certificate (NAC)/ issued by NCVT (DGET, NEW DELHI) in relevant trades as mentioned below. APPLICATION FEE a) Candidates are required to pay a fee Rs.50/- (Rupees Fifty Only) through Debit Card/Credit Card/Internet Banking. b) SC/ST/EX-Serviceman/Person with disabilities/Women candidates are exempted from payment of fees. Candidates seeking exemption from fees must enclose copy of the caste certificate/disability certificate/discharge certificate along with the application. c) Fees once paid shall not be refunded under any circumstances nor can the fee be held in reserve for any other examination or selection. Candidates can apply on or before 28/5/2016. The selection process shall comprise of Written Test of 100 marks and Trade Test (Practical). Documents verification & Medical examination shall also be considered as a part of selection process. The written test shall be fully objective and OMR based. The candidates short listed in written examination shall be called for Trade Test (Practical Test) and verification of certificates/documents in the ratio 1.25 times of the number of vacancies. Trade test is an essential part of the selection process of Industrial Employees. Viva-voice, if any, considered necessary to test the skill of the candidate being considered for recruitment, shall form the part of Trade Test. Trade test shall be merely qualifying in nature. It shall not decide the merit of the selected candidates. The merit will be decided solely based on the results of the written examination. The candidate who fails in the Trade Test shall not be considered for recruitment, irrespective of marks scored by him in the written examination. In the selection process, other things being equal i.e. marks being equal, trained Ex-Trade Apprentices of Ordnance Factory Khamaria and other sister Ordnance Factories shall be given preference. 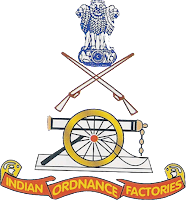 Candidates other than Ex-Trade Apprentices of Ordnance Factory Khamaria and other sister Ordnance Factories, who scores equal marks in written test, shall be placed in merit as per the DoPT orders. After uploading of requisite details in online application candidates have to pay application fee of Rs.50 (except SC/ST/EX-Serviceman/Person with disabilities/Women candidates) through Debit Card/Credit Card/Internet Banking. After final submission of the Online Application, the candidate will have to print out the Application and send it to address – Post Box No-2091, Adyar Post Office, Chennai. Candidates are advised to retain with them a copy of Application for future reference. Candidates should note down the registration number and password for future reference. Admit cards for Written Examination & Trade Test will be issued through online within 60 days. If there is any delay candidates shall refer our website http://ordkham.gov.in for reason of delay. Candidates shall apply strictly through ONLINE APPLICATION only. Application through any other mode i.e. Offline mode shall be rejected. Candidates may refer our website http://www.ordkham.gov.in or http://www.ofb.gov.in for detail advertisement. The candidates should ensure that he/she fulfils the eligibility criteria regarding Educational Qualification, Age and Caste. Particulars furnished in the application form should be correct in all respect. If any false/incorrect information furnished by the candidate is detected at a later stage, his/her candidature will be cancelled without prejudice to taking legal action against him/her. Mere submission of Online Recruitment application will not guarantee issue of Admit Card. 10% of vacancies are reserved for Ex-Serviceman. They are eligible for age relaxation. 3% of vacancies are reserved for Persons with Disabilities. Orthopaedic persons who suffer from not less than 40% and Hearing impaired persons who have a loss of 60 decibel or more in the better ear are eligible for reservation. Candidates are advised to mention a valid mobile number and E-mail Id for future correspondence. No GPF and DCRG scheme is admissible to the post under Central Government for those appointed on or after 01/01/2004. The New Pension Scheme i.e. DEFINED CONTRUBUTORY PENSION SCHEME is compulsory for all Central Government Employees who are appointed on or after 01/01/2004 and hence all appointees will be governed by this scheme. The services after appointment are liable to be transferred to any Ordnance Factory in India, subject to exigencies. Canvassing of any kind will disqualify the candidate. However it is emphasized and reassured that the written test and selection process will be done strictly on merit and in a transparent manner. Candidates are advised not to fall prey to the unscrupulous elements. The candidates who are Government Servant should enclose NOC in original, along with the certificate from there establishment that “NO DISCIPLINARY ACTION IS CONTEMPLATED/ PENDING” against them and that they have no objection in releasing them in case of selection with his application. If a candidate enters into Government Service after sending the application form, he must produce NOC from his employer at the time of undergoing any of the further process for the recruitment /selection. The above posts are temporary, but likely to be permanent. Rejection of application.- The application shall be summarily rejected on following grounds:- i. Online Application without payment of application fees shall be rejected (Except SC/ST/PWD/EX-SM/WOMAN candidates). ii. Online Applications without meaningful colored passport photograph and data/ details shall be rejected. iii. Online Applications without uploading signature/thumb impression/colored passport photograph shall be rejected. iv. Uploaded signature/photograph shall match with signature made and photograph pasted by the candidates on the application form. v. Applications without clearly visible signature/thumb impression/colored photo shall be rejected. vi. If the hard copy of application & application fee not received on time, online application shall be rejected. vii.If copies of duly self attested supporting documents are not enclosed with the application, then application shall be rejected. viii.Mismatch of name, father’s name and Date of Birth in Online application form with the enclosed 10th certificate/NTC (National Trade Certificate)/NAC (National Apprenticeship Certificate) shall be rejected. ix. Mismatch of trade in online application with NTC/NAC shall be rejected. x. Detail verification of original document will be performed by OFK & OFN before trade test. xi. Only selected candidates will be informed of their selection in due course after the selection process is over and no correspondence on the subject would be entertained. Candidates are warned that they should NOT i. Furnish any particulars that are false or suppress any material information in filling up the application form. ii. Submit tampered or fabricated document. iii. Obtain support for his/her candidature by any means. iv. Use any unfair means during the test. The General Manager, Ordnance Factory Khamaria, Jabalpur reserves the right to cancel the recruitment process or increase/decrease the number of vacancies.